A picturesque little market town located at the head of the Wylye Valley. 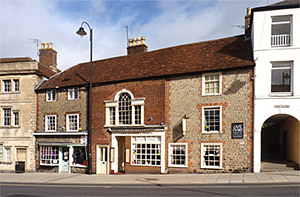 Once a former prosperous wool and cloth centre, its streets are packed with beautiful Georgian houses and attractive cottages, together with several historic Inns dating back to the 18th-c. There's a good variety of independent shops, cafes and restaurants, plus the Cornmarket Shopping Mall. Silver Street is renowned for its fine antique and quality furniture shops. A weekly street market is held on Fridays. The tiny Church of St. Lawrence, on the High Street, was founded as a chapel of ease in the early 13th-c. The town grammar school, established in 1707, claims Dean Stanley and Dr Arnold (the famous headmaster of Rugby School), among its former pupils. The Lake Pleasure Grounds, in the centre of town, provide a boating lake, bandstand, children's playground and a skateboard park. Set in the heart of the verdant countryside, on the edge of Cranborne Chase, Warminster offers ideal opportunities for walking, cycling and riding. The closest visitor attraction is Longleat House, seat of the Marquess of Bath and Europe's first Wildlife Safari Park.